>> Click here to read more ! >> Click here to download the beta rules (PDF) ! Golgo Island PDF now available ! Golgo Island is a fast-paced Pulp/Mulp game built around the WarEngine system (previously incarnated in ShockForce and GWAR: Rumble in Antarctica by DemonBlade games) that has been around for over several years now on the WarEngine wiki, the free space for all things WarEngine. During that period, Golgo Island has progressively grown into a complete, stand-alone setting; one aimed at bringing all kind of over-the-top action focusing on Pulp or B-Movies heroes to your tabletop for fast-paced, tongue in the cheek games. Golgo Island is supported by a range of high-quality 28mm miniatures manufactured and sold by East Riding Miniatures. 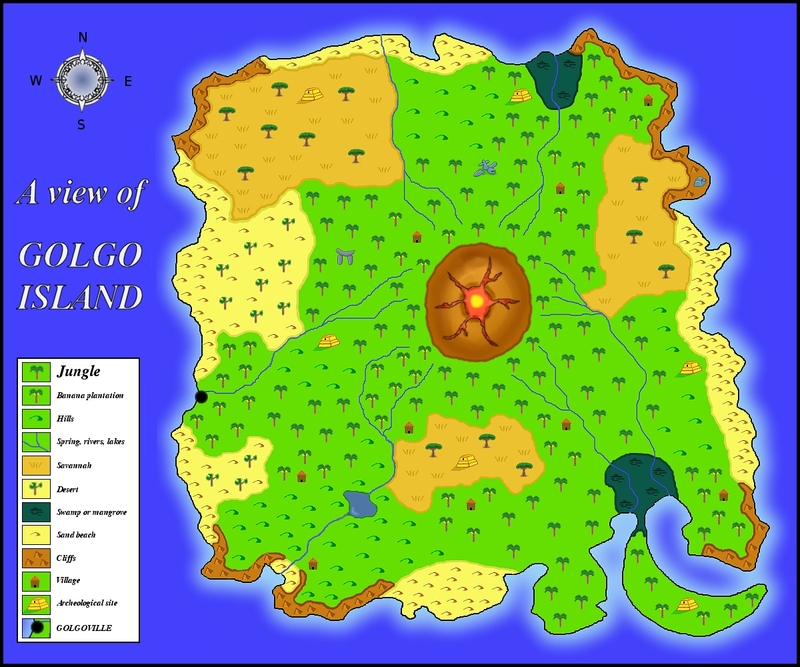 Golgo Island requires very little investment to be played, and can be an excellent introduction to the WarEngine : with 2 Heroes per player and 10 Creatures, you have enough figures to play some fun games. While the Golgo Island figs are absolutely awesome and you should get some by the dozen, the rules were made to allow you to create the profiles you like for whatever fig you like - so stop wondering what you could do which those figs you impulse bought and stocked somewhere in the lead pile: just do them a profile and they'll belong to Golgo! If you live in America, you can also get them from Duane and Laura Fleck at Syr Hobbs wargames. Golgo Island is a place of mystery and riches, of dangers and plots, of adventure and romance. From all over the vast world surrounding it and beyond, adventurers of all kinds flock to fulfil astounding missions or undertake unbelievable quests, facing unsuspected opponents - human, animal, mutant, extra-terrestrial… Or other! There is a place that haunts the dreams of explorers the world over. Like a fever it burns into their minds and twists their souls. They dream of an island. An island of mythical beauty, of danger, of fortune. However, this is no myth. Golgo! Where the harsh dry deserts of the Vornoon Camel Warriors border the darkest jungles of the twin hoofed Pygmies of the hammer headed Dwarf god, Torvik. Golgo! Named after the huge volcano that looks down upon all from the centre of the island and belches fire and destruction upon the unworthy and unwashed! Every disreputable bar and tavern, from the King's Head to the Queen's Fist, has its share of stories of those who sought fame and fortune upon Golgo. Unfortunately, most of these stories tend to have an unhappy ending involving the hideous slaughter of all who were involved. In fact for horrible slaughter, you would be hard pressed to choose a better place to visit. Much of this unspeakable violence emanates from the island's various cults. One of the most unpleasant of these is a delightful collection of savages and lunatic outcasts who worship the volcano itself. Seeing modern man as a blight upon their primitive utopia, they have dedicated themselves to slaughtering him wherever he may be found. Only through this process of complete blood-soaked carnage may the original balance of the island be restored and nature reign supreme. Golgo be praised! Of course, not everyone on the island is a clinically insane volcano worshipping psychopath. Others are quite normal and worship bananas. It is said during the seventh age of Pestilence, the gods took pity upon the people of Golgo and bestowed upon them a wonderous tree whose strange yellow fruit would cure famine and make them strong. Since this day, the banana has been revered as a sacred fruit. It is a foolish man indeed who mocks these beliefs and those who desecrate the holy monuments soon find themselves victims of the ritual of the Banana Split, perhaps the most feared and disgusting of all forms of sacrifice. Golgo Island is not for the limp of wrist or faint of heart. Only the very brave (or very stupid) need apply. Those that do, however, will be rewarded beyond their wildest dreams. For example, what explorer could resist the chance of investigating the Caves of Woobiemanta, where legend maintains that seven golden monkeys guard the temple of the Diamond Rhino God, whose statue bestows great wealth and happiness upon all who gaze upon his horn. Then there are the lost tombs of the Obscenely Rotund Monks. Buried deep in the jungle amidst the only specimens of the 3 headed Purple Pixie plant left in existence (worth a fortune in botanical circles alone), the tombs are carved entirely from jade. It is said that a sacred cooking pot hidden within has the power to cure famine and that the secret wine vault hoards a beverage that restores youth and cures all illness. Reputed to give a terrible skull crushing hangover, though. A small price to pay, no doubt. Some sights are worth a thousand sticky deaths. One of them must surely be the Ghost Dragons of Ixthrola. They are only seen during a crescent moon when Mars is in alignment with the seventh point of Saturn and the wind is blowing from the East. These mysterious beasts ride across the sky like animated clouds breathing multi-coloured fire. They appear to have no solid substance to them, merely wisps of light and fury. Their appearance is said to herald great fortune...or hideous disaster. Mention must also be made of the Lake of the Bronze Turtles. Some claim the turtles to be elementals created by the Forge Gods who once lived inside the Great Golgo itself during the Age of Fire. Others say they are of mechanical origin, having been manufactured by a rogue scientist who crashed onto the Island in an iron airship. Whatever the truth is, they are truly magnificent to behold. Singing, dancing, swimming, all for the benefit of onlookers. It is worth remembering, however, never to offer them bananas. Not one morsel. For although the banana is worshipped upon the Island by some, the Bronze Turtles despise them with an insane fury that defies belief. Those that would be so foolish, disappear without any trace, save for an empty banana skin. For those wishing to find a piece of modern civilisation and a little whiff of home, there is always Golgoville. Golgoville is a charming harbour town run by the vilest criminal scum that ever slouched ashore. It is here that crime lords like Bronto ‘The Buffalo' Benson compete with such gangsters as the Scottish-Jamaican pimpster, Goldtooth McSmiley, in a savage game of untold wealth and unspeakable violence. Attracted to this situation like maggots to a festering wound are lowlife of every description: the drunken sailors of the wrecked SS Hellfire, the petty pickpockets of Green Fish Street and the strange hooded cultists of the Un-named God who lurk at every corner, stroking their sacrificial knives, all waiting for the chance of some easy prey. But Golgoville is not without its appeal: business is booming. It is perhaps not much of a surprise, however, to learn that the most profitable business is prostitution. For this reason, female visitors are advised to be heavily armed lest their fate be the same as the Sunnysands Beach Volleyball Team who unwisely ventured there several months ago and are currently missing presumed servicing fat, sweaty, gun toting maniacs. Shot off kneecaps and bullet ridden corpses are an occupational hazard for businessmen specialising in this field since competition is high. A similar problem awaits those wishing to profit from the sale of drugs manufactured locally from the highly toxic Reaper's Hood mushrooms and the exotic Blue Poppy. In return, this situation helps another group of local businessmen. Businessmen such as Blind Oscar the gunsmith. Never without customers is Blind Oscar and his store behind the salami warehouse in Ferret Alley is always busy. It is said that all who visit Golgo Island never want to leave. Some never have the choice. May the Benevolent Banana look kindly upon you and smite ye not!